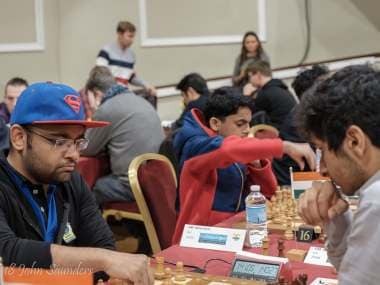 Around the halfway mark, the tournament leaders doubled at the Chess.com Isle of Man Masters in Douglas. In the premier game of round five, overnight leaders Wang Hao and Arkadij Naiditsch played a careful 36-move draw. While this helped both players keep their lead, it also allowed Abhijeet Gupta and Jeffery Xiong to join them in the top spot. Both Gupta and Xiong defeated higher-rated oppositions in the fifth round in the form of Vidit Gujrathi and Richard Rapport, respectively. Contrary to the 'win every game' approach they had adopted so far, Wang Hao and Naiditsch decided to play in a more stable manner while playing each other. The Exchange variation of the Queen's Gambit just served as a prelude to the solid game that was to ensue. Post the opening, the players continued playing a risk-free game which ended with a draw by repetition after 36 moves. Gupta scored his second straight upset of the event, beating Vidit Gujrathi on board four, thereby spoiling the latter's 24th birthday. In the previous round, Gupta had defeated the Vietnamese number one, GM Le Quang Liem. In the game, Vidit initially had a comfortable position from the black side of a Nimzo Indian Defence. On his 25th turn, however, Vidit went for an exchange of queens that netted Gupta a pawn following a tactical shot. By the 30th move, players had reached a rook and bishop endgame where white had the extra pawn. While Gupta had the better position by this point, converting the game was no mean feat. Also, Vidit is not the kind of player who would give in easily. The game lasted well above six hours during which Gupta had to display excellent technique to convert the game. Talking about his technique, Gupta said it was typical of his playing style. "Even yesterday, it was equal-ish or slightly better for me and I managed to convert it into a six-hour game. So, probably, it is typical of me," Gupta said to GM Daniel King in his post-game interview. The 17-year-old Jeffery Xiong was another player who joined Naiditsch and Wang Hao in tournament lead after a win over the artsy Hungarian, GM Richard Rapport. When he knew of being of being paired against Rapport, Xiong said he did not feel "completely enthusiastic about playing Rapport". 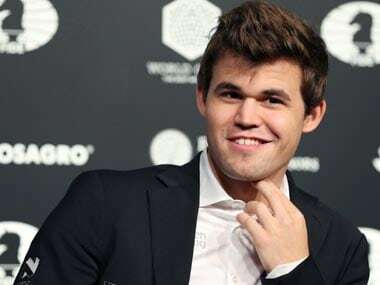 However, he also showed great respect for the Hungarian Grandmaster, saying, "It's really, truly an honour to play Rapport. I consider him to be the most creative player in the world, actually." In the game, the young American took the bull by the horns, giving up a piece for two pawns in a complicated middle game. For Rapport, such a farrago is home turf. It was him who had complicated things, just six moves into the game with a pawn sacrifice in the centre of the board. Xiong said after the game that he had underestimated this and had landed in a worse position with his king exposed in the centre. The cold-blooded computers, however, just dismissed the position to be equal, adorning their algebraic remarks with multiple zeroes to the left. Xiong's speculative piece sacrifice came on the 21st move before which the silicon monsters had already begun to give him a significant edge. After the sacrifice, the engines did not like black as much. 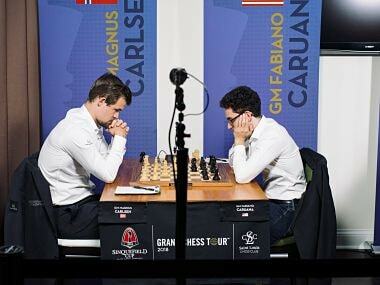 For a chess-curious human eye, however, this was a spectacle to behold. Xiong strived to find a way to get his pawns rolling while Rapport tried to prove the superiority of his piece over the black pawns. Nearing the first time control, Rapport lost the thread of the position and moved his knight to the wrong square on the 37th move. In four more moves, Xiong's pawns were about to queen and his rook also stood poised to wreak havoc in the white camp. Rapport decided to throw in the towel at this point. Most of the other top games were drawn. In fact, only eight out of the top twenty games finished with a decisive result. 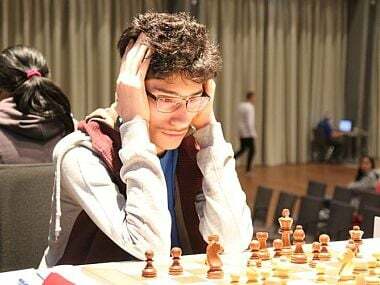 Another important upset by an Indian came on board 22 where GM Swapnil Dhopade bridged a rating gap of more than 100 points to defeat the former World Junior Champion, GM Aryan Tari. Prodigies, Nihal Sarin and R Praggnanandhaa drew against Adhiban Baskaran and Georg Meier respectively. Both Adhiban and Meier were rated about 100 points higher than their young opponents. After five rounds, Arkadij Naiditsch, Wang Hao, Jeffery Xiong and Abhijeet Gupta are jointly leading the tournament. 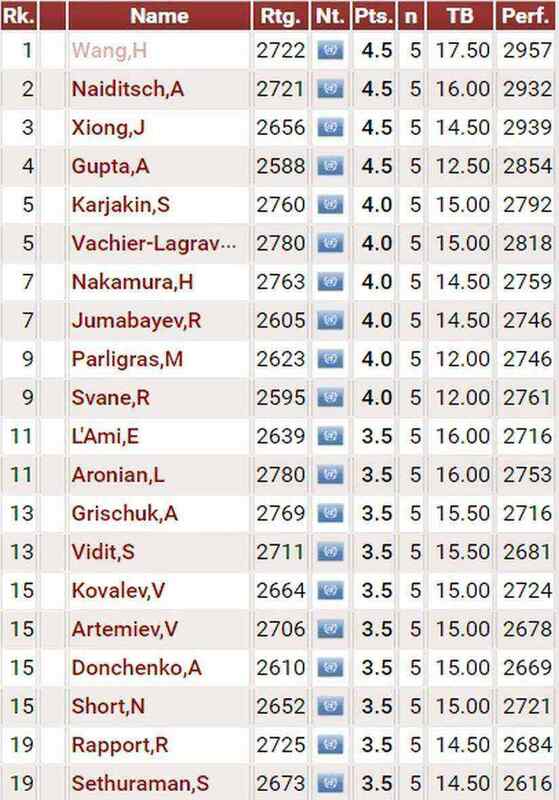 Just half a point behind is a pack of seven players that includes world-class grandmasters like Maxime Vachier Lagrave, Hikaru Nakamura, Sergey Karjakin and Radoslaw Wojtaszek. With four rounds to go and so many players in contention for the title, the tournament remains wide open.